A family funeral firm in Country Durham has developed a programme of community activities that gives their business a social focus. Whitehouse Funeral Service, which has premises in Darlington and Newton Aycliffe, was founded by John Whitehouse around 15 years ago. He was subsequently joined by his father Mel, mother, Dorothy and wife, Julie. All the family members believe strongly in making the business part of the community. They have built friendships and alliances over the years, as well as being regular supporters of local charities, hospices and organisations. 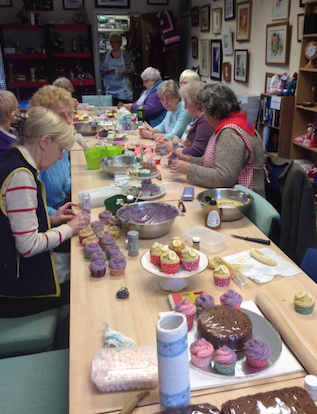 This approach has evolved into setting up coffee mornings, activity sessions and friendship and social groups under the banner ‘Sharing Together’. Dorothy and Julie have a unique combination of skills to make this work. Dorothy has a passion for crafts, while Julie ran her own catering business before moving into the funeral world. They go into hospices and organisations to run various activities but they also have space on the premises for groups of up to 20 at a time. The groups also organise themselves – often getting involved in charity fundraising.